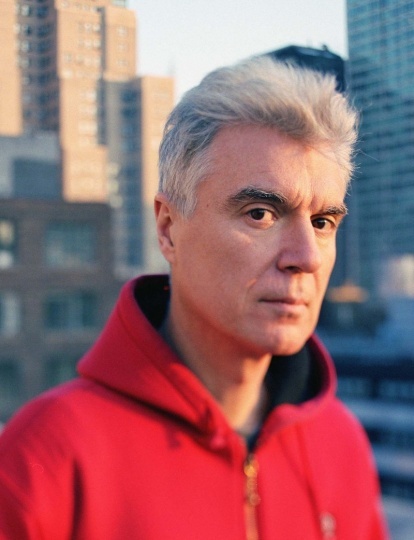 Talking Head's David Byrne is just a dreamin' man. I am in an African village, staying with a local family. It is a Sunday (or similar day off) and family, relatives and friends have all assembled for a backyard get together. There is a large table with food, and people are in attractive local dress (instead of the Western stuff worn during the regular week). My hosts and some others appear and ask me if I am impressed with the young man’s talent. “Is he not great?” I tell them yes, I am impressed, he’s amazing, but I politely omit the fact that his talent is, to me, completely useless. My hosts press on, “Since you recognize this man’s talent and skills, don’t you think he could surely be a success in your country?” I am flummoxed, and try to explain nicely that his talent is astounding and surprising — if you close your eyes it really could be Neil Young — but to me, it is of no interest past the moment of initial shock. My hosts aren’t having it. They KNOW this man is talented — and they’re right — and are therefore absolutely certain that he could be huge outside of their village and surrounds. I again try to explain that in my country, a Neil Young already exists, and an African copy, however faithful, is simply unnecessary. The discussion peters out in mutual misunderstanding and incomprehension. More on David Byrne and Neil Young and other musicians dreaming about Neil Young. Well, the interpretation of that is obvious. David Byrne would like to be the tropical exotic tapped into the fundamental musical source of the universe. But he is not African, he is not young(anymore) and he is not Neil Young. "You may ask yourself..am I really dreaming?" David, your on the road to nowhere! !Start making sense! Too bad there would be nowhere for this kid to go, but Vegas. Doesn't sound like he writes his own songs.......Sounds like D Byrne is a little jealous! It's just a hippie dream if you ask me. I don't see why the vitriolic comments are necessary. Byrne was very successful back in his days with the Talking Heads and I enjoy his music. He's one of my favorite artists, right behind Neil Young. He makes perfect sense with his comments. Do you thing an african-born Neil Young cover artist would make it in the USA? Why would the average person listen to him, when they could buy the real thing? Also, I think it's become pretty evident with the way music is right now, is that it doesn't matter how much talent one has. A person either has to catch a lucky break or know somebody inside the business to help them along. I doubt he'd get that. Great for the kid, I'm glad he found a cool passion, but let's not kid ourselves. It was only a change of plan? With the promise of a man. Wait. Are we supposed to be posting our Neil Young dreams? I better get busy. Get in line, David Byrne. Hey I applaud the kid for having a go. Most successful bands, before they become a success, cover other bands or artists work. Then if they have real talent, they can put that to use in writing and creatiing their own style and genre. The world, IMOA will never have another Neil Young but new talent can always be appreciated, if grabs you, and its from the heart, and its their own work. Very amusing story. A bit sad though that some people are taking it as an attack on Neil. Grow up folks. You don't have to go to the USA to be successful as an artist however if you are interested in becoming a commercial success (bucks in me pocket) its a good place to try. Yeah, I'm not sure what's up with some of the comments Worthless Recluse . Maybe folks missed that this was totally a dream. maybe they thought Byrne actually experienced this? Hey, I am a huge neil fan here........HUGE. Also a big David fan. It was a dreaqm posting on a blog. Chill. They are misicians and their music makes us feel better. End! The Talking Heads Rocked in their own way....back in the day. I saw NY 6 times in 2008/2009 and he killed every show. I saw David Byrne in Paris late last year and in such a small venue (1500 or so) he completely blew me away in another fashion. Here are a few 2009 clips of how he was on tour.....everyone i9n white very theatrical and all. They are from performances on a US TV show. Like Carol in Michigan, my Neil dreams are way more exciting than David`s! Surely what David`s dream is saying that there is and only ever will be one Neil Young, no matter how well people can try to imitate him. He is unique.